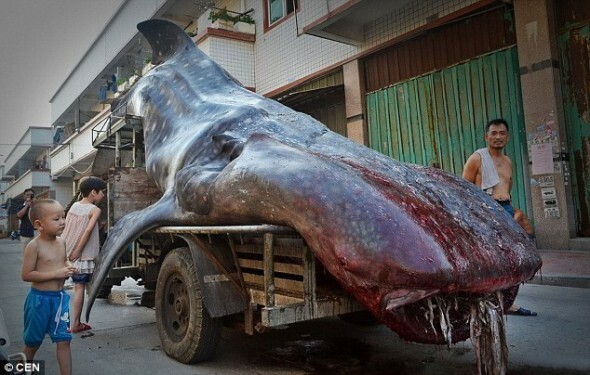 Cai Chengzhu was fishing in Xianghzhi, eastern China, when he found this 16ft-long whale shark – before lugging it onto his tractor and driving it for half-an-hour to a market in nearby Shishi. A fisherman in China was delighted to haul a giant fish from his nets – until he was told that his mammoth catch was an endangered whale shark, and could not be sold. The fisherman, Cai Chengzhu, was at sea last week in Xiangzhi, Fujian province – in the seas between China and Taiwan – when their nets were suddenly weighed down. He said that as he and his colleagues began to pull their net out from the water, they spotted a huge hole formed by the “giant fish”. “It’s believed that the giant creature broke the net and got inside to eat the fish we caught,” he said. They believed that the 4.5m-long animal, weighing two tonnes, died while it struggled to escape from the net. Whale sharks can live for up to 100 years and weigh around 20 tons at full maturity. 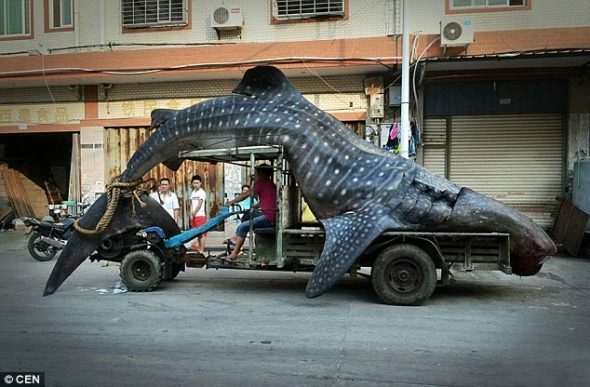 Mr Cai transported the whale shark to market with a tractor, with the huge fish strapped on the roof. He reportedly planned to sell it for 10,000 to 20,000 yuan ($1,626 – $3,251) before he knew what the creature was. It is illegal to purchase or sell whale sharks – the largest known fish in the world. The biggest whale shark ever recorded was 13.5m long, and they weigh as much as some dinosaurs. Feeding on plankton, they are found in tropical and warm-temperate seas and can live for 70 years. 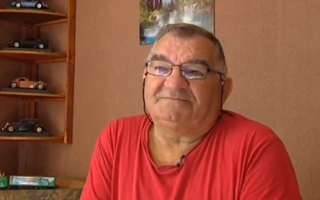 A pensioner (retiree) was forced to obtain a letter from his doctor certifying that he was still alive after the French health service refused to pay his medical expenses on the grounds that he was dead. Jean-Marie Sevrain, 68, who lives in France’s eastern Vosges region, said he was left speechless when he received a letter last month informing him that he had died more than four years earlier. The letter said he was not eligible for a refund of 23 euros ($30.48) for a routine visit to his doctor to renew a prescription for anti-diabetes medicine “because of my death on the 4th of January 2010”. Things became even more surreal when he telephoned the health service office that processes refunds. He was told to prove that he was still alive. He duly returned to his doctor, who wrote a note certifying that he was still living. After presenting it to the health service, Mr Sevrain obtained his refund. He said the explanation he was given for the mistake was that his doctor had taken over the practice of another doctor who had died on January 4, 2010. The health service office was not available for comment.